The Hunting Act 2004 finally outlawed the hunting with dogs of live mammals. The activity most immediately affected was fox hunting which, in its traditional incarnation, is now illegal in England and Wales. The move caused controversy, with many pressure groups criticising the law. But regardless of your feelings, the Act looks like it is here to stay – and fox hunting is illegal. There are, however, some legal alternatives to fox hunting. These are growing in number and popularity, and new alternatives are being developed all the time. Drag hunting was already a popular sport before hunting with dogs was outlawed. It is so called because it involves the ‘dragging’ of a scent across a trail. This scent is often artificial, but it might also be the scent of a dead animal. Dogs are set off once the scent has been laid, along with riders on horseback. Depending on the variation, the ‘hunt’ will end either when the dogs have reached the end of the scent, or when the dogs have caught up with the volunteer dragging the scent. Drag hunting is generally competitive; the first dog to reach the end of the trail, or to reach the volunteer, is considered to have won. Much of the criticism of the Hunting Act revolved around the idea that hunting is often used for practical purposes, rather than simply for entertainment. In recognition of this, the Act includes provisions for ‘flushing out’. The Act allows the use of up to two dogs to flush out, or stalk, a wild mammal. But this is only permitted in certain specific circumstances. You may use dogs to flush out animals when that animal would cause serious damage to livestock or to game birds. It is also permitted when to do so would help preserve the area’s biodiversity. While the Hunting Act put an end to traditional forms of hunting, the hunting with dogs of certain animals is still permitted. The most obvious exemptions are for rats and rabbits. It is legal to hunt these animals with dogs in cases where they are deemed to be pests. It is also legal to use dogs to retrieve a hare that has been shot on your land. If you want to retrieve a hare that has been shot on someone else’s land, you need the landowner’s permission. Finally, you can use dogs to rescue a wounded animal. This is particularly useful in cases where an animal has been shot but has only been injured, rather than killed. 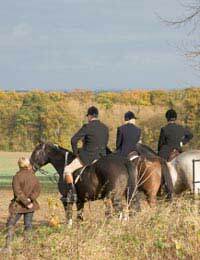 The Hunting Act dramatically changed the hunting landscape. It has made traditional hunting impossible, and prosecutions have been brought against those who have failed to abide by it. But this doesn’t mean that elements of the hunting experience cannot still be preserved. Hunters have long said that hunting is about the thrill of the chase, rather than the kill. With activities like drag hunting, it is possible to maintain this thrill while staying within the parameters of the law. Think Someone is Hunting Illegally? What Should You Do?